A great thing about the Internet is that, in a print publication with limited space, there's no need to spend precious column inches recounting an otherwise necessary history of EgglestonWorks, which is based in Memphis, Tennessee. You can read all about it in the late Wes Phillips's review of the original Andra, in the October 1997 Stereophilethat issue's cover story. Three months later, in the December 1997 issue, the Andra was voted Stereophile's Loudspeaker of the Yearand made that issue's cover as well. Paul Bolin reviewed the Andra II in November 2002. Later came the Andra III and the Andra III SE, which we didn't review. If you're a fan of photographer and composer William Eggleston (one of his photographs graces the cover of Big Star's Radio City), EgglestonWorks was founded by his son, Bill Eggleston, who is no longer involved. All of the EgglestonWorks Andras were variations on the same basic theme. 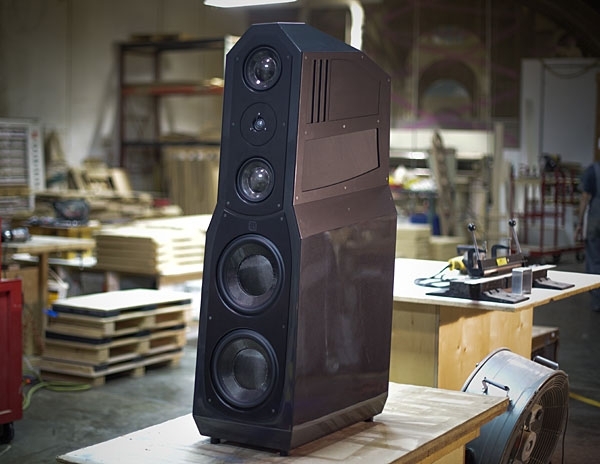 The Viginti, which costs $38,995/pair, strays farther from the original tune, beginning with its two 10" carbon-fiber woofers, made by Morelprevious variations had only a single, larger woofer. The magnet structure of the new woofer is said to be "enormous," though I didn't find my way inside to have a look. Wayne E. Prather, PhD, of the National Center for Physical Acoustics, University of Mississippi, is a technical consultant for EgglestonWorks. According to a design study paper he sent me, Chief Designer Jim Thompson says the 10" drivers "function more as subwoofer drivers than as traditional woofers." The goal was to keep the midrange and lower-midrange frequencies away from the heavy-diaphragmed, long-excursion cones that, Thompson says, are "essential for superior low end bass but are less well-suited" for reproducing the middle frequencies. Makes sense to me. The subwoofers are crossed over to the midrange drivers at 120Hz (low pass) and 110Hz (high pass). This produces a slight overlap between the two, which is said to provide a smoother overall response. The Viginti is the first EgglestonWorks speaker to use a slot or shelf port. Thompson says that the port enables the design team to fix the bass tuning frequency with "pinpoint accuracy." It also improves the lower notes' "pitch-correctness" and "tightness." The enclosure behaves, he claims, as a sealed box down to the very low port tuning frequency of 30Hz, and that low tuning frequency puts the resulting group-delay phase shift in a region where our ears are minimally sensitive to phase errors. 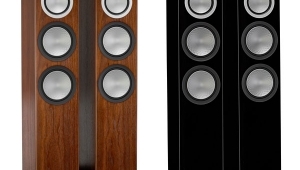 The Viginti marks the first time that EgglestonWorks has used a midrange-tweeter-midrange (MTM) driver array. Correctly implemented, such an arrangement can act as a virtual point-source driver that, at the crossover frequency2kHz in the Viginti's caseproduces among the three drivers a uniform horizontal dispersion characteristic. The Viginti's crossover includes Mundorf's best silver/gold foil capacitors, and inductors, some of which are hand-wound in-house. The 6" carbon-dome midrange drivers are also made by Morel, while, for the first time, EgglestonWorks uses a beryllium-dome tweeter, this one made by Scan-Speak. Of greater interest is the Viginti's transmission-line midrange loading. The design team paid particular attention to how to dissipate the energy the drivers radiate behind them. As you probably know, the back wave is equal to the front wave radiating into the room, with which it is 180° out of phase. In a rigid enclosure, the back-wave energy ricochets around inside the enclosure. EgglestonWorks says that this imposes on the speaker diaphragm distortions of both phase and level that are superimposed on the front wavethe soundwavesthat reach your ears. While treating a speaker cabinet's insides with absorptive material can suppress and absorb high-frequency backwave energy, EgglestonWorks argues that, in the midrange and lower midrange, where our ears are most sensitive to distortion, the efficacy of these absorptive materials is much less.Therefore, the Viginti's two 6" midrange drivers are individually loaded into quasitransmission-line chamberstapered, heavily damped tubes that terminate in openings at the cabinet's rear. Absorptive material attenuates the backwave energy as it travels through the tube on its way out the back of the enclosure. What little energy is reflected back into the highly damped tube is further attenuated. Thompson also claims that the residual back wave output produces a desirable "ambience," in the manner of a dipole speaker, though in the strictest use of the word the Viginti is not a dipole speaker. Because each midrange driver operates within its own isolated, tubular enclosure, the designers elected not to isolate the interior chamber behind the MTM array from the rest of the cabinet's interior, thus producing a woofer enclosure of considerably larger volume than would usually be possible in a cabinet measuring 50" high by 14" wide by 23" deep. Thompson doffs his mortarboard and dons his salesman's cap when he says "Although extremely expensive to implement, the 'Transmission Line' midrange porting design delivers midrange detail and purity, which to our knowledge, cannot be achieved in any other way." The panels of the Viginti's well-braced enclosure each comprise two slabs of 5/8"-thick MDF glued together, for a total thickness of 1.25"; the platform to which all this is anchored is four such layers thick: 2.5". The internal braces are of HDF, as are the two midrange quasitransmission lines. The side panels of the upper section are fully braced, with panels of black-anodized aluminum, accented with carbon-fiber inserts. The piano-black lacquer applied to the MDF surfaces is finished to a very high standard. Two pairs of terminals are provided, for biwiring and biamping (I used jumpers). The Viginti is well constructed and looks mighty attractive. The first few minutes with any new speaker are fairly scary: I've committed to the review. I've used floor jacks to raise my huge reference speakers, the Wilson Audio Alexxes, then replaced their spikes with casters and rolled them out of the way. Now, for the next few monthsmonthsI'm going to have to live with these new speakers. The relationship doesn't always work out. Sometimes there's a personality conflictI don't like the sound. Sometimes, the speakers just don't work in my room. The EgglestonWorks Viginti's webpage says: "no lack of authoritative, effortless and pitch-perfect bass." They're not kidding. The first record I played made it clear that the bass went very deep and was tightbut not too tight, because then it wouldn't match what's above. Still, it took a while to get used to the differences between the Alexx's and Viginti's reproductions of the bottom end. ... "although extremely expensive to implement, the 'Transmission Line' midrange porting design delivers midrange detail and purity, which to our knowledge, cannot be achieved in any other way", he sounds like the reincarnation of the late Bud Fried in his proselytizing on the subject transmission line loading. That internal cabinet brace in the shape of a bass clef is just too cute. "Nope. A pair of Vigintis costs $38,995. In the world of high-performance audio, that price is ridiculously low for what you get." That's in the world of high end... Because in the professional world, sensitivity is at least 96dB/w/m and prices are half. JBL pro studio monitors of the 44 series Japan available should compete favourably against this other incarnation of impossible sound reality reproduction. "His tom fills were so slammingly perfect and believable that the only thing to do was to turn up the volume until it was at the level of live drums." no. just no. I know you're trolling, but I've heard JBL pro monitors - both the 4412 amd 4430. the 4412 was somewhat unpleasant to listen to but hard to break, the 4430 was okay to listen to but you missed out on a lot of detail a better monitor would show you. the 4412 was fairly popular - name recognition + hard to break (and Bruce Swedien used 4312's I think for a while). I will give JBL credit where it's due - they have made good horns for a while now and continue innovating (horns still VERY popular in sound reinforcement). For most people, pro monitors make horrible speakers for casual listening. most people don't want to hear all the flaws in their recordings - it's really annoying. "For most people, pro monitors make horrible speakers for casual listening. most people don't want to hear all the flaws in their recordings - it's really annoying." So pro-monitors expose the flaws in people's recordings, in other words reproduce faithfully EVERYTHING recorded as in serving what High Fidelity is all about, while the corollary of your statement is that other speakers don't and that's great?? Then why spending top $ on any other component with pompous borrowed Grand Crus or composers names that is supposed to extract every detail of the grooves or bits? Listen to real instruments: that's what it is all about, not intellectual constructions. ...because to my eyes, there's nothing pleasing about the look of those speakers. I like the look of them. It looks to me like the sound is the result of great form and engineering. It often seems like as we go up the quality scale the less of a rectangular box we find. The follow-up will tell the tale. "The subwoofers are crossed over to the midrange drivers at 120Hz (low pass) and 110Hz (high pass)"
For the record: this is absolutely typical speaker crossover design. What matters is the electro-acoustical matching throughout the region, not the specific Hz at which either side may measure -6dB electrical at. I am surprised to read that Bill is no longer involved w/ Eggleston? Whom owns/operates this company presently? Bill was all but forced out in 1998 and the company went bankrupt in 1999. Mike Sabre, who had been handling the business end of things bought what was left for $8000 and the company resumed operation after a three month pause. Looking at the measurements of this speaker, it shows someone building speakers, who should rather not. From below 1 KHz until 10 KHz, a gigantic resonance is defining sound. And drivers are driven with opposite phase. Almost everything you should not do is done. I hope the craftmanship is beautyfull though.